In 2010, the MMTA Board of Directors developed the Service Award to recognize MMTA members whose commitments to the Association go beyond the call of duty and promote our mission to provide our membership with the tools needed to meet the diverse challenges facing them by offering education, services, continuing professional development and ethical standards. We congratulate our three very deserving 2017 honorees: Paul Linn, Linda Poole, and Lorraine Jackman. Photos: Annge Horning presenting Paul Linn his award; Barb Fandell presenting Lorraine Jackman with her award at the 2017 Fall Conference. Paul Linn, of the City of Ironwood, was honored with the 2017 MMTA Service Award in grateful recognition of outstanding service and dedication. The MMTA Board of Directors acknowledges Paul’s commitment and loyalty through his generous service to our organization and membership by assisting with the continued success of MMTA in the UP, serving as “chauffeur” for conferences held throughout the state and his generous spirit of recruitment and advocacy on behalf of MMTA. Paul is a tremendous blessing to the organization and we stand stronger because of his support and encouragement. Linda Poole, of the City of Marquette, was honored with the 2017 MMTA Service Award in grateful recognition of outstanding service and dedication. The MMTA Board of Directors wishes to acknowledge Linda for her support and leadership to help ensure the continued success of the MMTA in the UP. 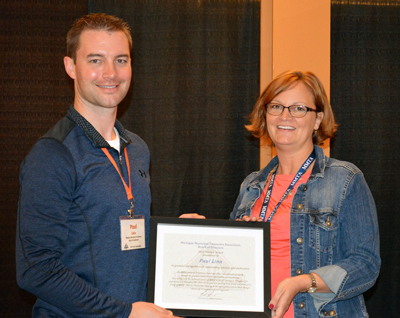 Her willingness to readily volunteer to serve the organization as a trusted advocate in the recruitment and delivery of education programs to her peers in the Upper Peninsula is greatly appreciated. The Board expresses its sincere gratitude to Linda for her efforts toward the betterment of the MMTA. Lorraine Jackman, of Comerica Bank, was honored with the 2017 MMTA Service Award. The MMTA Board of Directors wishes to acknowledge Lorraine for her commitment and support of the Association over the past 24 years. 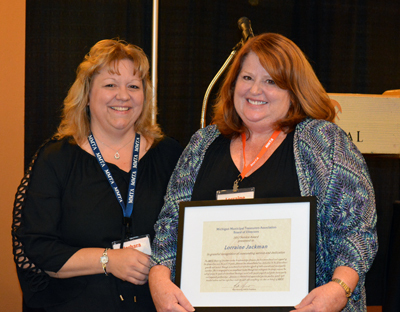 Lorraine has demonstrated her dedication to the Association’s growth and success through recruitment and retention efforts of both associate and municipality members. She is recognized as an exceptional leader through her willingness to always answer the call of service to speak at educational trainings, assist with special projects and foster municipality and corporate partnerships. Lorraine is admired and appreciated for her positive spirit, light hearted nature and her infectious smile she puts into everything she does on behalf of MMTA.